Ooh, the long awaited 1.5 update! 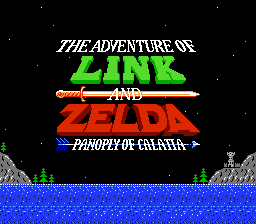 This, plus the really LAZY edit of Zelda 1 Nintendo just released on the NES Online app, gives me the needed reason to replay through this game. Welp, time to redownload the game and replay it, and continue raving about it to friends on ZU. Once again, thank you SO much for all the hard work and effort you put into Panoply of Calatia. It really is the best quest I've ever played in my life, and truly feels like it lives up to the franchise standards. THIS really is Zelda III to me. Also, I've played your sailing demo, Mitsukara. Once again, your incredible skill just blows me away. There is just so much effort put into the one demo and shows an immense amount of promise. Best of luck to you on the development of Memories of Koholint. Edited by OkamiTakahashi, 11 October 2018 - 01:26 PM. Version 1.63 is up on the database! EDIT: Due to more undercombo and cset errors, and possibly a missing elevator (in a shaft going down so it wasn't gamebreaking), now it's Version 1.62. I recommend updating. You can use the same save file as before, just copy and paste the new version of the quest over the old one (or make a backup if you see fit). EDIT 2: Version 1.63 is currently being uploaded. It has no major changes from version 1.62, but it allows the Roc's Cape to be used again after riding on a spinner track, as well as fixing minor combo errors and slightly improving the visual appearance of certain areas. Updates ARE compatible with old save files, so you can copy this new version of the quest into your ZC folder and use your old save file- just make sure to grab the latest version of the music too. Finally added a "Boss Rush" mode of sorts. There are no prizes, but you can choose to re-fight all of the bosses and minibosses in a post-game area. One new item, an improvement for the Good Octorok, now exists and can be obtained by completing a small new challenge involving carried objects. Certain climbable overworld ledges can now be hopped down a la LTTP/gameboy games. They have also been added to a few new locations. New scripted Geru knights appear in various sideview ares, as well as "quadrupedal Zora" enemies (sometimes known as Basilisks). Made several major tweaks to a certain gold dungeon to liven it up a little and reduce the emptiness, with small new challenges. Added slightly more of a puzzle to the room after you fall in Yamauchi palace, and altered the room down the basement stairs. Darknuts can now be hit by arrows for 1/4 damage, and Tunkrads can be hit by the sword for 1/4 damage. This does not apply to the gray (splitting) variety, who will still block those weapons. Various tweaks to certain Impa hints and final battle hints. Some enemy locations have been changed or moved based on my experiences replaying the quest. Poes now take damage from arrows. Moved the new Soejima Palace shortcut, introduced in 1.5, back a couple rooms to fit better with the progression of the dungeon. Ceiling masters work slightly better and cast a warning shadow that covers the player. All Moas can be pushed by the shield, and their number in the valley area has been reduced. Replaced Impa's unhelpful hint about how to stop Link's beetle in the castle basement with a hint about the location of the anchor. The Wrecking Ball now creates a dust trail when it touches any breakable blocks, so you can tell they're breakable if it's not going full-speed. Several dungeons now have additional (optional) wrecking ball-breakable areas in sideview for shortcutty secret / convenience purposes. Blaino statues now have a wider hitbox and are less finnicky about hitting vertical targets, greatly simplifying certain puzzles. Added two more hints regarding beetle usage. Added an additional raft/wind sideview segment to a late game lava cave. Several tweaks to the final dungeon entrance to make mechanics clearer up-front before the first severely confusing puzzle. Error mode now has a small chance of spawning rising lava or crushing ceilings. If a falling pushblock lands on you, it will now cause four hearts of damage to the player. Some new, simplistic Bouncer objects appear in new places. The raft minigame now displays the swim ring on the player for a moment when it is used. Added a way to get a secret free level-up in the level-down house in Caragonne town. The pre-final boss has had additional tweaks involving the floor, HP during a change in the fight, and a slight adjustment to speed. Slight tweaks to the joke dialogue seen after defeating Moosh's bonus boss. The aquamentus staff, the good octorok, Bow-Wow, and the Bee, although the Bee has a limited time before the boss will destroy it. Additionally, the two "Agahnihm" fights now play NSF LTTP Boss music by Klopp422, an the Thunderbird boss now uses Zelda II Famicom Disk System battle music instead of continuing to play the Great Palace theme. The Parachute Leaf now creates sparkles as you move. Spinner tracks have been slightly redrawn to look a little less like LTTP's Somaria tracks. A mountain area has been tweaked regarding which screens have the ash layer on them, and lava. The triforce check screen now sparkles and plays hopeful music (the same Maze of Galious song as when you finish a dungeon) after it is opened. Sprite the mouse cursor Fairy can now make the credit fireworks explode sooner if she touches them. Whistle warps in a certain mountain now return you to the beginning of that dmap, instead of defaulting to the first town. Previously, this had created an issue where the rising lava or falling ceilings could carry over to inappropriate maps. Fixed a battle scene warp on a certain screen which, while previous functional, had warped you to a town dmap instead of the battle dmap, with the wrong music, cset, and continue point. Fixed an issue from 1.5 with the new Dragon Slayer IV/Legacy of the Wizard MSX music track used for Nakago Palace, which previously would play the wrong song if selected in the music selector. Fixed a bug where, in a certain dungeon, the whistle wouldn't resume the music until you went to another screen. This was the only thing I started out meaning to fix, before spending half a week on the rest of this update. Added a ladder to a room in a certain gold-colored palace where you might have (sort of) gotten stuck if you entered with the elevator too high. Slight fix to the ending loading behavior that is only relevant in an obscure situation involving the hookshot/switch hook to get through walls to complete the game in an unintended order (AKA "Dimentio's Bug"). Fixed buggy interactions between the flute and the tablets that display song notes. Fixed a case in a specific dungeon in which finishing playing the flute did not resume the music on that screen. When you press Start while using the flute, the music will now resume properly. Fixed a bug where the flute warped you to the East Calatia dmap at West Calatia destinations. 1.61: The changes to the compass room in Yokoi palace in 1.6 made the compass unobtainable, which has now been fixed. 1.61: A broken CSet issue in the level-down house in Caragonne has been fixed. Edited by Mitsukara, 01 December 2018 - 07:36 PM. Oh, uh, whoops. Guess I spoke too soon about diving back in! Ah well, no harm done, wasn't very far anyway. Time to start again! I just took another run-through of the game. I like the little changes. I'm finding all these areas I never explored before. It is, of course, going a lot faster than my first playthrough, (I got stuck so many times. XD ) but the helpful hints really did add a ton to it. Well done! I love how creative people can get with the items. - If you get to a late-game area which requires the thunder spell, but do not have full magic, a special magic container appears which can increase your meter to the maximum. - A "Hero's charm" item can be purchased in the final dungeon which reveals the hit points of the final boss as well as increasing Zelda's arrow speed. The best boomerang can also be purchased here if the player missed it previously, because it may be needed for a certain puzzle if the player also did not find the level 2 superbombs. If anyone wishes to reuse the original scripts from Panoply of Calatia for a new project, you are still welcome to do so. However, version 1.65 uses some files not found int he support pack, which can be found in this zip file. If you raft onto the east side of the Death Mountain area, a message will comment on you doing so. If you do not yet have the Triforce pieces, you get a different message. It is possible to proceed to the south, but a new hazard will make it more difficult to enter the final dungeon if you try to enter without the Triforce. It is possible to get past it anyway, but difficult. You probably need most of the items from the triforce dungeons to complete the final dungeon anyway. However, this whole thing does make the "boy, you're rich" lady accessible much earlier. The 1.64 update is compatible with old save files, as long as you put the replace the old version of the quest with the new one (though you can keep a backup of the old one if you wish). However, please make sure you have all the music files from the 1.6 Support Pack in your Zelda Classic program folder when updating. I'm glad to hear the updates were an improvement! Rather than totally redesigning the game or making changes too drastic, a lot of them are meant to be little balance/coherency improvements, based on things I noticed going wrong in LPs (particularly MeleeWizard's, Eppy's, WillPlayIt/Old Skool's, and LowBiasGaming/Kewlio's, though I also watched some others and have tried to keep up with mixed results- SCKnuckles started on it but I'm not sure if he was still thinking of completing it since he's left youtube temporarily, and I was terrible about keeping up with the updates on that one. New Journey's Fire has also been playing it recently, but more gradually over time, and that is ongoing). Basically I kept noticing flaws in hindsight and I couldn't stand to leave it as it was. Plus I thought of extra little puzzles that would help teach the item usage better, so that the player is less likely to forget things like the uses for the ladder and the beetle. If you're looking for ZC 2.50.2, it's still on ZeldaClassic.com's downloads page. They also have an archive of older versions, should the need ever arise for 1.92 and whatnot. I'm not sure exactly in what way you're aiming to advertise it to people (obviously it's not for profit so I assume you mean telling people person to person), but hopefully people will like it and no one will want to blow up ZC or anything XD Then again, I think there's slowly been more movement towards the open source version of ZC anyway so hopefully ZC will live on for years to come (it's crazy to think it's been almost 20). If ZC gets fully settled into a new version at some point moving forward, I might make a compatibility update if the need arises, but that would probably just be to fix new version bugs that may arise. Edited by Mitsukara, 21 December 2018 - 01:00 AM. Ooh, more tweaks. Always welcome. I get what ShadowTiger meant by advertising. I do the same- I find every opportunity I can to mention this quest to someone; mostly in the form of quick plugs in headcanon posts on Zelda Universe. I even told my theorist friend on there; she's helping me develop my take on the timeline; naturally I had to include this magnificent quest and a few other things; she's helping me piece them all together. At this point I'm just repeating myself though, spouting the same old praises for this expertly crafted adventure. Welp, back to the old grind. Thanks for the early (late?) birthday present, Mitsukara! Good luck with all that adulting and the webcomic project. Although this was technically not gamebreaking in 1.65, it did result in sending the player to a room near the end of the palace instead of one of the caves on the way to the entrance, as well as in another cave leading to an empty empty "guy cave" room. Oops. - An upper layer platform in Marui has also been recolored to gray to improve visibility against the lower layer. Thanks to Moosh for discovering this issue for me! And my apologies to anyone else who encountered the bug. As always, this update is compatible with old save files- just replace your old "Link and Zelda - Panoply of Calatia.qst" with the new one. Edited by Mitsukara, 19 March 2019 - 02:42 AM. So apparently the newer version has some changes to the dungeons? I am stuck in Maze Palace, in the room to the left of where you get the Aquamentus Staff. There's a bomb shooter and a bunch of water tiles in the way now. I looked up playthroughs on Youtube but the room doesn't have that in the way in those playthroughs. Can't you use the water mail to get past the water? Nope, due to the Water Boots I can only walk on top of it. Edited by Dimentio, 27 March 2019 - 11:01 AM. This is still for ZC 2.50.2 right? I downloaded that specific version but am noticing a good amount of bugs throughout. It looks like the Water Mail randomly doesn't let you through water without removing and putting it back on. Not sure what causes it. I haven't gotten back to that room yet but I imagine that was the problem. Okay. After much procrastination and some false starts, I have managed to complete this quest from start to finish. I have to say, this is the absolute gold standard in Zelda Classic quests for me. The enormous amount of content it has to offer must not have come easily, that's for sure. There's one thing I am missing, however. One very small detail at the very end. Since I have cleared the quest, I'm fine with being spoiled about it. How do you activate the shortcut located on the initial descent to Ganon's lair?